Bánh Mì describe their namesake dish as an "amazing fusion of a French baguette and Vietnamese tastes." The bread roll in question is often called a Vietnamese roll, but if you're heading past the street carts in Vietnam, its called bánh mì. 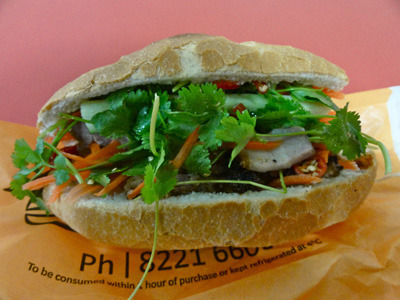 You can find them in their finest glory at Bánh Mì in Adelaide's Chinatown. Like most Vietnamese food, flavour is of utmost importance. The combination of pâté and mayonnaise with meat, coriander, chilli and fresh vegetables that give this rolls their flavour kick. They are growing in popularity all over Australia, even to the extent that Bánh Mì have dedicated themselves to these fresh rolls. Bánh Mì offer a range of options including vegetarian, cold meat, chicken, beef, roast pork, or combination. If you ask me roast pork comes very highly recommended. Make sure you ask to hold the chilli if you're not as strong with the hot stuff. Sometimes they pack quite a punch. You can get other Vietnamese treats including cold rolls and vermicelli bowls. To drink try a traditional Vietnamese coffee, also known as cafe sûa dá, or a refreshing coconut juice. Bánh Mì stick to traditional Vietnamese flavours, not altering the dishes like some places do, or selling generic Chinese food along with their Vietnamese dishes. If you're looking for an introduction to Vietnamese cuisine then this could be a start. Visit the central markets to get a great Vietnamese feed for under $10. Bánh Mì also offer catering options, so visit their website if you want to have some tasty food at your next meeting or event. It's a fresh look at event catering that will impress your guests. You can also join their ever growing number of fans on Facebook.